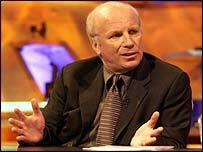 Here is the full text of Greg Dyke's e-mail to all BBC staff, sent a few moments before announcing he was quitting as director general. The subject line said "I'm leaving". This is the hardest e-mail I've ever written. In a few minutes I'll be announcing to the outside world that I'm leaving after four years as director general. I don't want to go and I'll miss everyone here hugely. However, the management of the BBC was heavily criticised in the Hutton Report and as the director general I am responsible for the management so it's right I take responsibility for what happened. I accept that the BBC made errors of judgement and I've sadly come to the conclusion that it will be hard to draw a line under this whole affair while I am still here. We need closure. We need closure to protect the future of the BBC, not for you or me but for the benefit of everyone out there. It might sound pompous but I believe the BBC really matters. Throughout this affair my sole aim as director general of the BBC has been to defend our editorial independence and to act in the public interest. In four years we've achieved a lot between us. I believe we've changed the place fundamentally and I hope that those changes will last beyond me. The BBC has always been a great organisation but I hope that, over the last four years, I've helped to make it a more human place where everyone who works here feels appreciated. If that's anywhere near true I leave contented, if sad. Thank you all for the help and support you've given me. This might sound a bit schmaltzy but I really will miss you all. I've enjoyed the last four years more than any other time in my working life. I attach the statement which will be released soon.